While our family was on a Tucan Travel tour in Peru, I was keeping an eye on the map to see if we would be passing close to any confluence points. Being on a bus with a fairly set itinerary, meant that any point would have to be close to a main road and 15°S 75°W turned out to be right on the Pan American highway. It had been visited a couple of times before but still something new for the rest of the group. We’d spent the night at Puerto Inca amongst the ruins of an Inca fishing village and were proceeding north along the highway, stopping to photograph sand dunes that periodically encroach on the road and have to be regularly cleared. As we approached the site Dave, our driver bought the bus to a stop and we a proceeded with the ‘GPS dance’ to get all zeros and noted a small cairn of rocks left by a previous visitor. The countryside can only be described as desert with not a living thing in sight. It seems there has been no significant rainfall here for over a thousand years. I took the required photos in the blustery wind, getting Dave to move the bus out of the field of view as needed and then we continued on to Chauchilla Cemetery where mummies had been preserved by the dry environment a few kilometres to the north of the confluence. 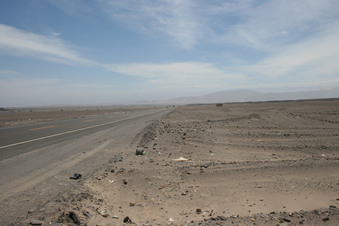 Further north and we arrived at the town of Nazca with its famous lines. A short information video, pre-flight, explained the latest reasoning for the lines made by these pre-Inca people. Rather than exotic spaceman theories it seems that they relied on water from rivers fed by the Andes. The glacial record shows a 40 year drought occurred and the increasingly desperate people tried to attract the ‘gods’ attention to their plight by making more intricate designs on the plateau. But of course no one knows for sure. The tour ended in Lima where we visited 12°S 77°W in the suburbs of Lima.